The classic trench. There is only one brand that epitomizes the style that is timeless and made with such top quality that it could last a lifetime: Burberry. 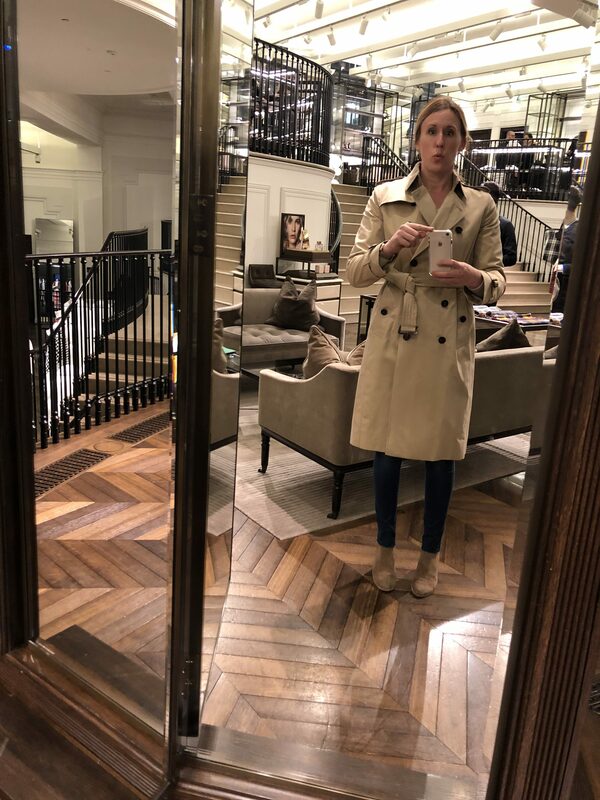 For over a decade, the Burberry trench has been a dream item on my wardrobe shopping list. Having purchased and worn more than three other brands made of varying materials and offering similar, but not quite the same shade of the classic khaki color (it is “honey” in the Burberry world), trying ever so hard to find a replica that would take the place of the item that was financially out of my reach, I was never pleased with the products I ended up with, at least not entirely – J.Crew came close for the price. 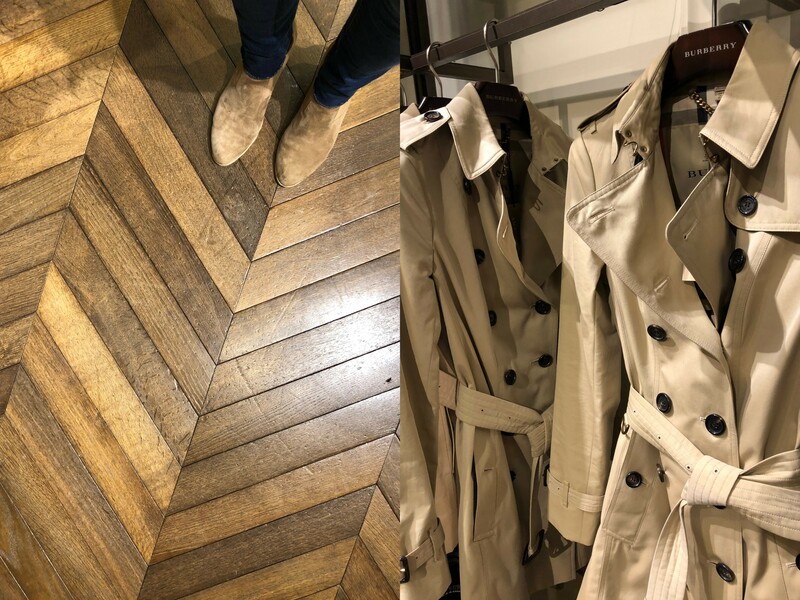 Either too narrow in the shoulders, not the proper length for my height, cheap material or a hue that did not complement my skin tone, I continued to be on the hunt to find a brand that offered the quality and classic timelessness of a Burberry trench. So I went to the source whilst on my trip to England last week. As you will see below in the images, the store on Regent’s Street is impressive in its multi-level interior, and presents itself more as a theater of the Burberry experience rather than a clothing store. Upon walking in the doors from the bustling Black Friday crowds, I inquired as to where I could find the classic trench coats, and I was led to the second floor where only about 5-7 trenches were hung on the rack. Why? The service was personalized. After all, if you’re purchasing a Burberry, it is an investment, and you want to make sure you get just the right fit which is precisely why I wanted to do my investigating for the right trench for my body in person – at the source. Being someone with broad shoulders who has ripped the seams out of two trenches only to need them to be repaired, I was not about to take a guess online as to the right size or style. As well, being 5’11”, I wanted a length that while on the model appearing to hit at the knees, actually did hit at my knees. Thus, I discovered that “extra long” was the length for me (see below the image of the “extra long” trench). There is one length beyond this as well if you’re looking for a mid-calf version. And of course the style. I was shown the “slim” fit which offered just as it described, but my shoulders ruled that option out. Nope, for me, I quickly discovered I wanted the classic (again, seen below – the classic style, also known as The Kensington). The hues to choose from were honey (the classic khaki color), navy, black, stone and red. And not to be forgotten, I received the important lesson as to how to tie the belt with the knot in the front as well as in the back. As soon as I saw the trench on, I was certain I had finally found my trench. Needless to say, my mind was eased as to knowing the purchase, while an investment to be saved up for in order to welcome into my closet, would be something that would last if not my entire lifetime, at least a couple of decades. 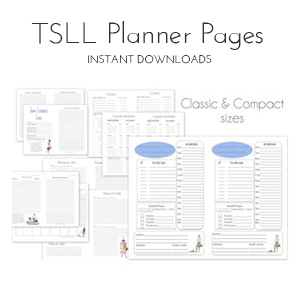 An example in cost-per-wearandchoosing quality over quantity. Yet another point to highlight is that our individual investments in our wardrobe are indeed personal. And while a model online or in a magazine or on the runway may look utterly stunning, in order to be assured the investment is worth our hard-earned money, we need to see it on ourselves. As well, we need to know ourselves, not only physically, but with regards to our lifestyle and how we go about our everydays. So whether you gravitate toward the classic honey or maybe (as shown in the images of inspiration below) a soft blue, choose what suits you and accentuates your personality, your preferences and your strengths. Currently Burberry is having a sale on coats here, but the classics, they unfortunately are not on the list. I have linked the coat I narrowed in on and is seen just below in the caption below, as well as added it to TSLL Capsule Wardrobe shop for future shopping if you are interested. With all of the items we welcome into our capsule wardrobe, the key is patience, giving yourself time to explore and choosing wisely for your unique signature style. Enjoy the exploration and trust that when you find what you are looking for, you, as I did in this instance, will know when it is exactly what you are looking for. Boy, Shannon, did you catch my attention with this post! 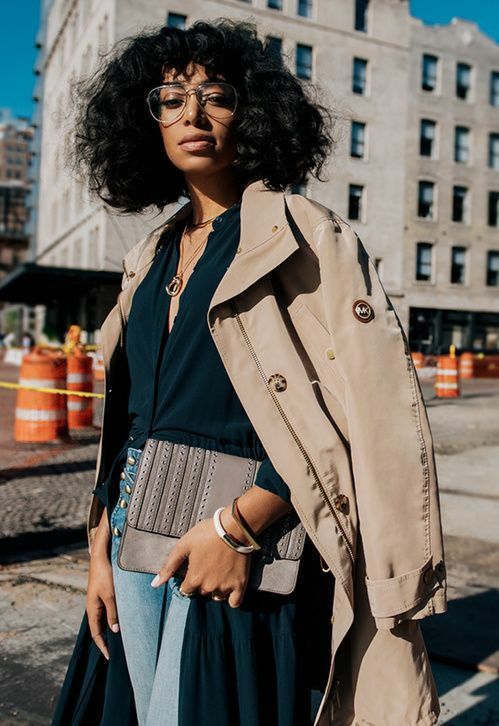 Twice in my life I’ve found the perfect trench, and both times I let them slip through my fingers because I felt the price — both were pennies under $1000 — was just too high to justify. And I regretted it deeply both times. Too late, I knew should have bought them & economized elsewhere. After the last one got away, I swore I’d buy the next one that called my name. It’s been 6 years & I have yet to find it, but I’ll be ready for it when I do! I prefer the loose casual ones to the highly tailored style, and I like them long — mid-calf or even longer — but I have to be careful because at 5’4″ I can be overwhelmed by too much fabric unless the cut is just perfect, even with the 3″ heels I usually wear. But I also want a bit of “classic”, because at the $1000 I expect to pay, I want it to last forever! Hence the long wait. Ahhh, my lovely — when WILL you appear to me? LOL! Thank you so much for reassuring me that I’m not a complete lunatic in my quest for the perfect trench . . . .
Congratulations on a stunning purchase Shannon. I really enjoyed your article, I can relate to buying cheaper trenches too. Good for you, saving and then savouring the results! Thank you for sharing your new purchase and for giving us a glimpse into the beautiful store. 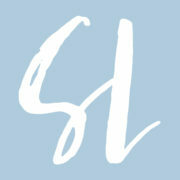 I love hearing stories of patience in curating the perfect piece to bring into a wardrobe. You look awesome! As always, what a very good piece of advice!!! The trench it’s absolutely amazing!!! Just two weeks ago I buy a cashmer camel coat… one of the gaps in my wardrobe for so many years…and you know which one is the one the moment you put it on…Don’t you??? What about a post on “Luxurious ways of saving???? I also have a problem finding coats/jackets that fit my arms and shoulders. Although I am slim, I work out, and as a result have more muscular arms than — apparently — most women. Usually the coat will go over bare arms quite well, but when you add a sweater (or two), it becomes impossible to wear. It’s not just coats — I sometimes find sweaters that are made for women with sticks for arms. Perhaps this might be a sign of the manufacturer cutting corners and using less fabric than needed? Reading your comment reminded me of a throwaway comment made sewing teacher made a few years ago – that clothes are made with tight sleeves to make them look younger. He dispaired because it reduced the variety of sleeves, but I can see why thats a problem for you. Forget what’s come before, it didn’t last. Stick to your guns and buy the Burberry. No regrets, looks fabulous and I’m sure (as an added bonus) has in-house Services e.g alterations mending etc etc which may mean an added trip or two back toLondon. What a hardship! I love the trench coat worn on Madam Secretary’s Secretary of State . Do you know the brand? I do as well and off the top of my head, I don’t. But I will try to find out. I absolutely love the classic style! 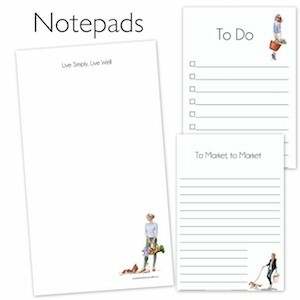 This item will remain on my wish list for a while, but as you stated, it is an investment worth the wait. Hello Shannon Absolutely stunning trench. As well as cost per wear, I also add in the the pleasure of wearing and caring for quality clothing. Remembering this definitely makes it easier to not be tempted into buying things that I know will be short lived and a waste of money. Great idea. I have done that myself as well for day wear items and pajamas. Thank you for sharing. As always Ms Shannon, a beautifully researched article however, I’m going to get a little controversial here…stay with me….I don’t like trench coats (on me). Gasp! I know, it’s a little shocking at first, my girlfriends have done their best to help me but to no avail. So sad. I do love the look on others and I have tried loads of trench coats on in the hope I may be cured however, I fear it’s hopeless, even Burberry wasn’t right for me. All is not lost though, I do tend to swoon at the thought of a well cut Mackintosh and where better to purchase the perfect Mac than from Mackintosh? The Mac is my version of the classic trench and worth every cent for a perfectly tailored version. Currently on my wish list is this little number https://mackintosh.com/au/shopping/tea-rose-bonded-cotton-mackintosh-coat-12238397?StoreId=10658. Mackintosh perfection. knee level so was pleased to see your pics. 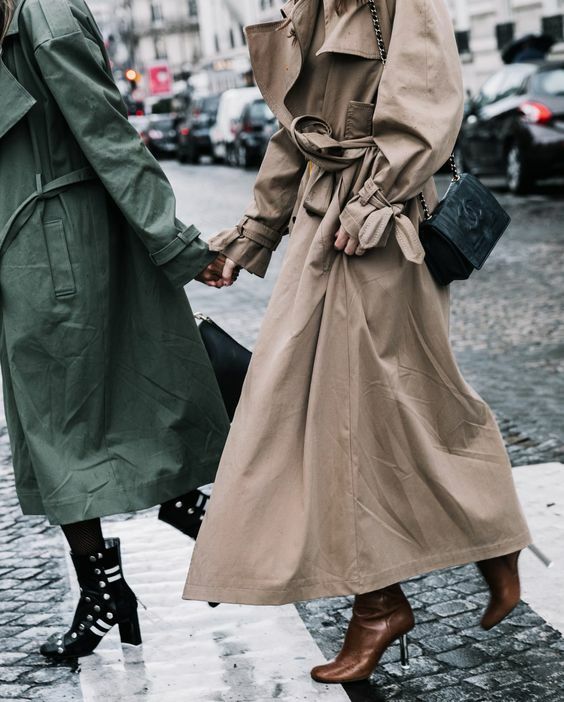 As for a Trench not suiting everyone it is like the architypal white shirt ‘if it’s not for you, then it’s not for you’ – spend your cash on something you love and that loves you – cashmere jumper, Laboutin shoes or gorgeous jeans and a Italian leather jacket etc Yum! My not-so-secret way of affording my single-breasted black Burberry rain coat was consignment. I found mine on The Real Real’s website, in great condition, and at a significantly reduced price compared to brand new. This is another way for those of us who appreciate high quality clothes to actually be able to purchase them in our lifetimes! 🙂 I really love the idea of giving these items a second life as well.